A brand new production of Sam Shepard’s Pulitzer Prize-winning play Buried Child is set to open at London’s Trafalgar Studios in November 2016. Premiering off-Broadway at The Pershing Square Signature Center, the play was nominated for two Lucille Lortel Awards and received huge critical acclaim. Ed Harris makes his West End debut as Dodge, after starring in the production off-Broadway in 2016. Buried Child follows Dodge and Halie, an American couple in rural 1979 America, who can barely hold onto their farmland whilst looking after their two wayward sons. When their grandson, Vince, arrives with his girlfriend, nobody seems to recognise him. As Vince attempts to make sense of the confusion, his family appear to be dancing round a very dark secret. A powerful drama, Buried Child is a gritty, dark and often cuttingly funny take on American families. Golden Globe Award-winning actor Ed Harris stars as Dodge, opposite Amy Madigan as Halie. Harris is best-known for his extensive screen credits, which include Apollo 13, The Rock, The Truman Show and A Beautiful Mind amongst many others. Madigan is known for her stage credits including A Streetcar Named Desire, as well as Grey’s Anatomy and Carnivàle. Jeremy Irvine joins, with previous credits including the 2011 film War Horse and Woman in Black 2: Angel of Death, and Game of Thrones' Charlotte Hope completes the cast. 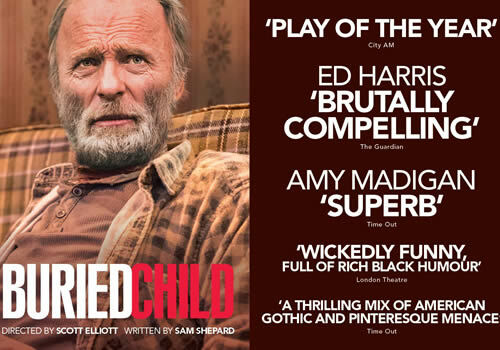 Directed by Scott Elliot, who has most recently had success with Jesse Eisenberg’s The Spoils, Buried Child has been described as an American gothic and has also been compared to Pinter’s The Homecoming. Considered to be one of America’s greatest playwrights, Shepard’s previous plays have included A Lie of the Mind, True West and Fool for Love. Opening at Trafalgar Studios, Buried Child runs from November 14th to February 18th 2017. Buried Child is not suitable for young children.